For all who are unaware of the little sister of Black Friday, today is Small Business Saturday. It’s the counterpart to big box retail sales of Black Friday and it encourages shoppers to hit up brick and mortar stores that are small and local. The deals are just as good too! It’s a concept I can get behind because it keeps our hard earned dollars flowing in our local economies. However, since this is a blog and is not brick and mortar in the slightest; I want to showcase some of my favorite Etsy shops that may or may not be having sales for Cyber Monday. I love Etsy because of it’s dedication to handmade goods. It’s the perfect platform for small startups to get their products to the mainstream. I could peruse Etsy for hours if I let myself, there are so many cute things on there! I wanted to share some of my favorite shops that feature a baking theme. Check them out and consider shopping small before heading out to big corporations when searching for that perfect, one-of-a-kind gift this holiday season! I’ll start with my obsession for aprons….because everyone knows baked goods taste better when made wearing an apron. Lover Dovers Clothing makes the most adorable aprons that look like Disney princess dresses. They come in kids’ sizes too! They also have various other retro style prints, but all of their aprons are handmade in a 50s style. Jassy Kitchen‘s aprons have tons of cupcake prints, and make “Mommy & Me” matching aprons for you and your little. Cute! 4RetroSisters features retro style aprons with lots of gingham and polka dots. Boojiboo is doing a Cyber Monday discount of 10% off through Monday when you enter 2013HOLIDAY10 at checkout! Woop! I just can’t get enough of her vintage colored prints! Ahhhhh charming overload! Kitchen Glam does full and half style aprons, but the half styles are made out of terry cloth towel! How smart! they have aprons for kiddos too. They even have chef’s hats! That wraps up the apron portion of this post, but there are tons more!! Livingthread does these kitschy little embroidered pieces. But these are not your grandma’s cross-stichings… they’re so badass! Designs By Nicolina does great posters and is doing a deal BLACK FRIDAY – CYBER MONDAY: 30% off Art Prints, 40% off Thank You Notes, and 50% off Recipe Cards. Punk Up Bettie‘s BLACK FRIDAY Sale runs from Nov. 27th until Dec. 2nd! Use discount code: BLKBETTIE20 for 20% off ENTIRE SHOP! 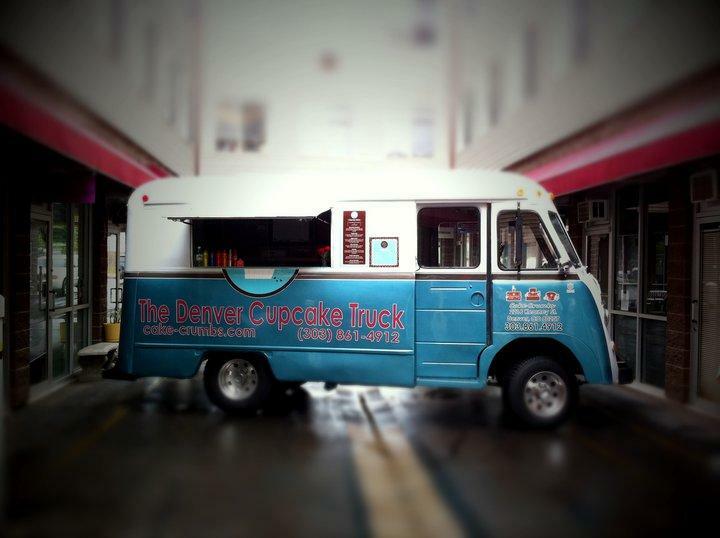 They do darling little rockabilly hair combs and clips with cherries, sparrows and CUPCAKES! And last but not least, Tied in a knot bowtique makes delectable little hair bows with cupcakes on them, much like the one in my picture! Too precious! I love them all! Please share your favorite shops in a comment! Posted in Uncategorized and tagged apron, baker, baking, Black Friday, cupcake, Cyber Monday, Disney, Etsy, hair bow, Julia Child, recipe, retro, Small Business Saturday. Bookmark the permalink. I realize it’s been a hot minute since I posted anything. To risk sounding trite: school has monopolized my spare time. soorrrrrryy. Admittedly, this is a bit of a lazy post. It’s less baking and more preparation for baking. Deal with it. 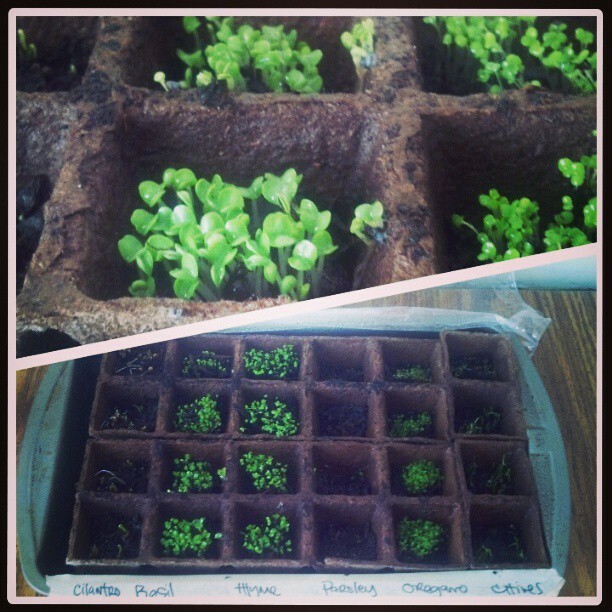 So I’ve been attempting to establish my green thumb….I got some seeds and dirt and got planting! I had this super original idea of putting them in mason jars that were attached to a piece of reclaimed wood and hanging them ever-so-handily in my kitchen for gorgeous meal preparation (thanks Pinterest)…. So great, right? No. After I moved them from their cardboard seed tray home into the mason jars they plateaued in their growth. Sad face. The pic above showcases about how big they got. I tried to get them growing! 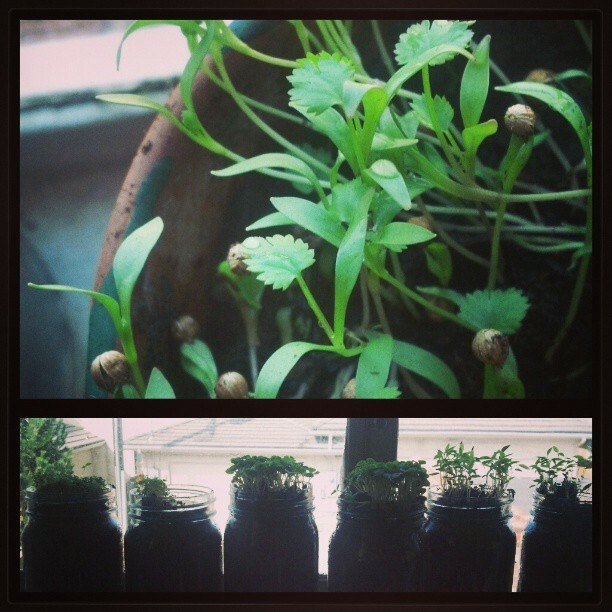 I watered them everyday, and bought herb food, and texted my mom who is an amazing gardener…. but they died 😦 womp womp. Apparently, herbs need more space than just a tiny mason jar. Ah, the trials and errors of wannabe gardeners. So down went my dreams of an adorable hanging herb garden, complete with chalkboard labels…and on to thrift store bought, mismatching pots on the only windowsill in my apartment that gets any sun. I’m not so proud that I can’t admit my failures…but I was determined not to give up. So I bought some seedlings and I’m happy to say I have more herbs than I know what to do with! yay! When I was herb shopping, I thought mint would be fun. I mean, who doesn’t love a fresh mojito in the summertime?! But little did I know mint grows like a weed. F’real. And as much a I love mojitos, I couldn’t keep up. So what to do with a boat-load of mint? Mint extract. woop. 1. Wash mint and pat dry. Now rough ’em up a little bit. Smash ’em, crush ’em, no need to massacre, but you get the idea. 3. Place tightly sealed jar in a cool, dark place for 1-2 months. What do you guys do with you herbs? I’d love to hear your ideas! 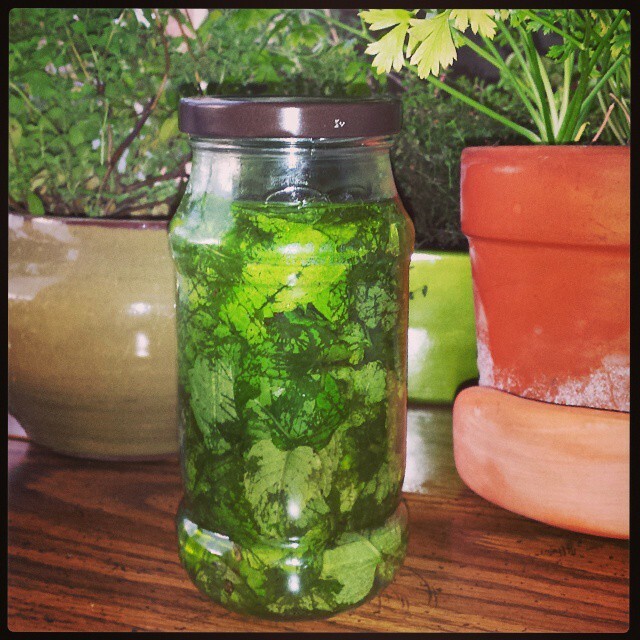 Posted in Uncategorized and tagged extract, garden, herbs, mint. Bookmark the permalink. 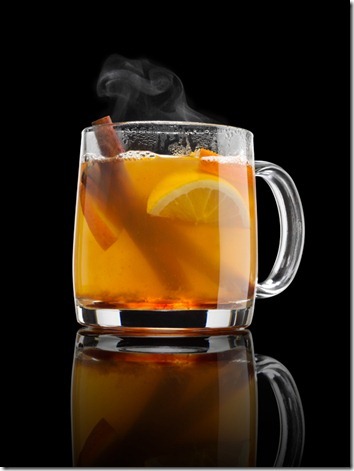 Posted in Uncategorized and tagged cinnamon, cure all, fitness, health, home remedy, honey. Bookmark the permalink. I had so much leftover Halloween candy, it was obscene. I live in a very family friendly neighborhood so I bought like 8 bags of candy. Not the crappy stuff either! “Crappy candy?” you ask? You know what I’m talkin about. Like Smarties and candy corn. A friend of mine actually rounded up a “Sick-or-Treat” tournament bracket of the worst candies and chronicled the path to the ultimate gross Halloween candy on her blog Ravaging Beauty. Check it out…but there were no circus peanuts or black jelly beans or those weird wax bottles filled with “juice” in my mix of delicousness awaiting little monsters. I had a gigantic bowl full of 100 Grands, Kit Kats, Baby Ruths, Butterfinger Crisps….and about 8 trick-or-treaters. Seriously. I was handing it out by the fist full. Please kiddos take my candy!!! Okay…that sounded a little weird. But I thought it was a little ridiculous to just bust out a batch of cupcakes, adding to the silly amount of sweets already in the house. Solution? 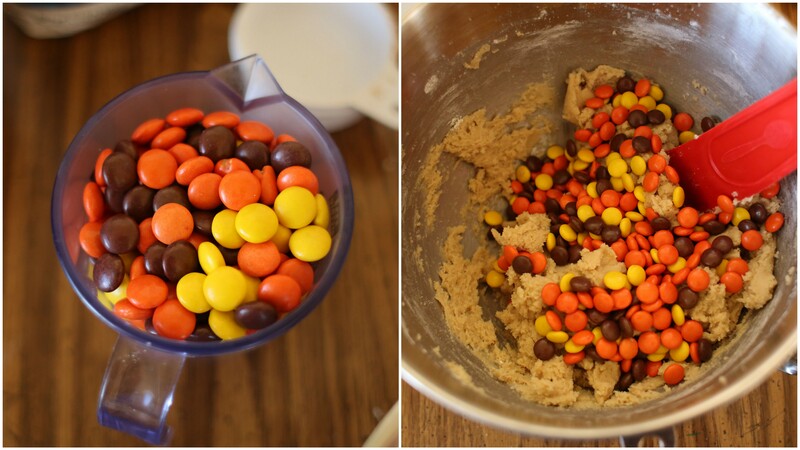 Put the leftover Halloween candy IN a batch of cookies! YES! I know. I know. I’m like the most original blogger you’ve ever stumbled across. Shut up. 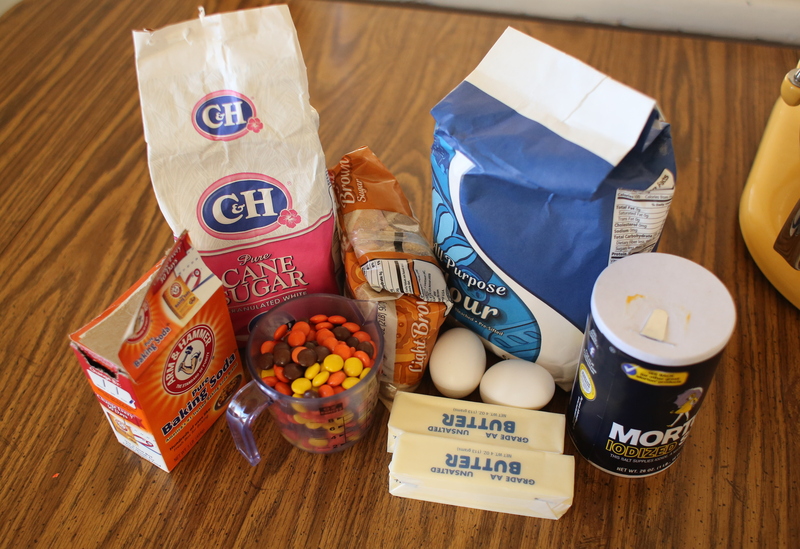 Mix up your flour, baking soda and salt and set aside. In a separate bowl, cream together your butter, sugars and vanilla. Add eggs 1 at a time. Throw that flour mix in there. Now fold in your candy treats. I don’t suggest eating this batter as there are raw eggs in it…but I did and IT’S DELICIOUS. Who can say no to cookie dough?? 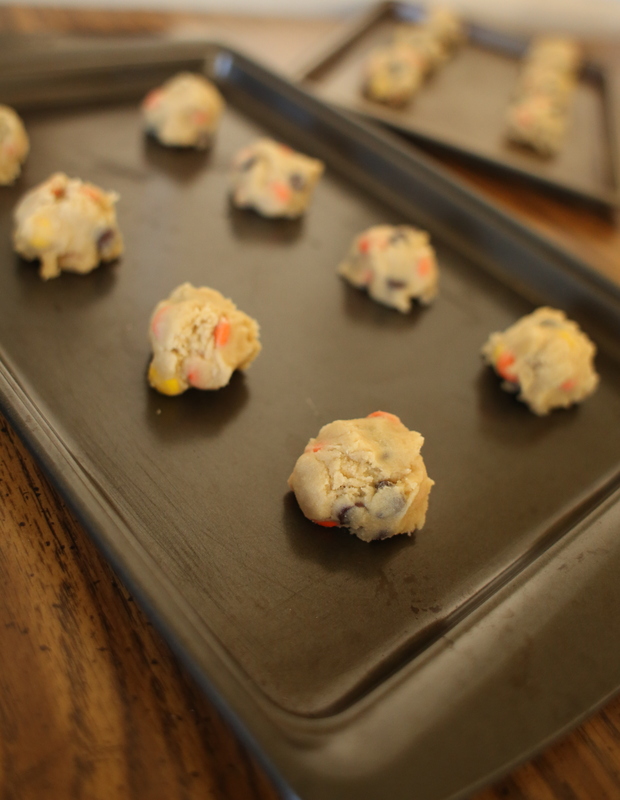 So plop them on your cookie sheet and bake at 350F for 9-11ish minutes, until the cookies are golden. 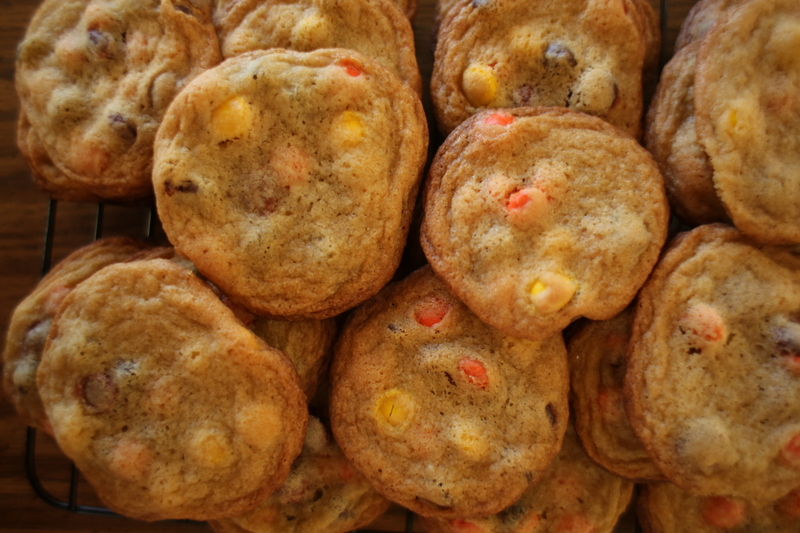 Posted in Cookies and tagged candy, cookies, Halloween, leftovers, Ravaging Beauty, reese's pieces, Sick-or-Treat. Bookmark the permalink. Most pears come into season September/Octoberish so right now is the perfect time for this warm, spiced treat. For this recipe, I used Bosc pears, which are great for poaching because of their crisp texture. Softer pears like Bartlett will fall apart during the boil. 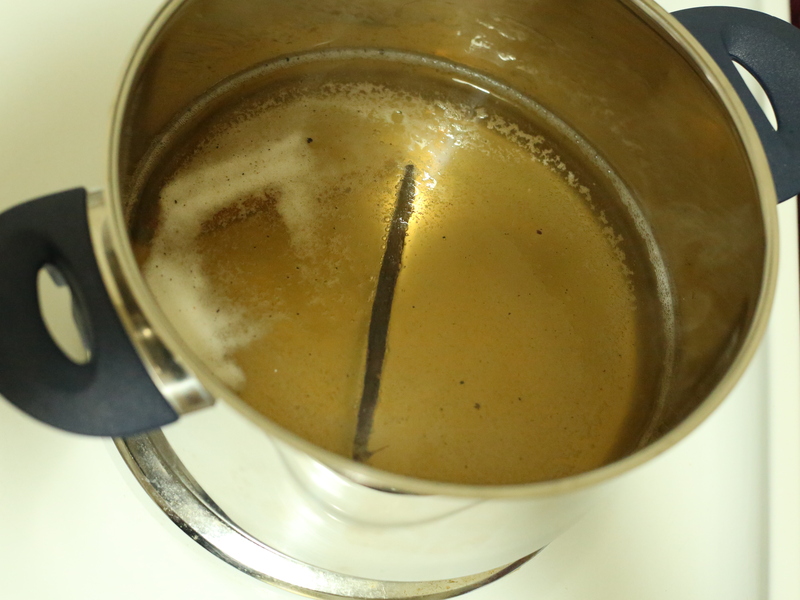 Start by getting your poaching liquid together. Put everything except the pears into a large pot and bring it to a boil. Prepare for your kitchen to smell amazing. You can essentially throw anything you want into that liquid. Whatever flavors you want your pears to take on-put it in the pot. 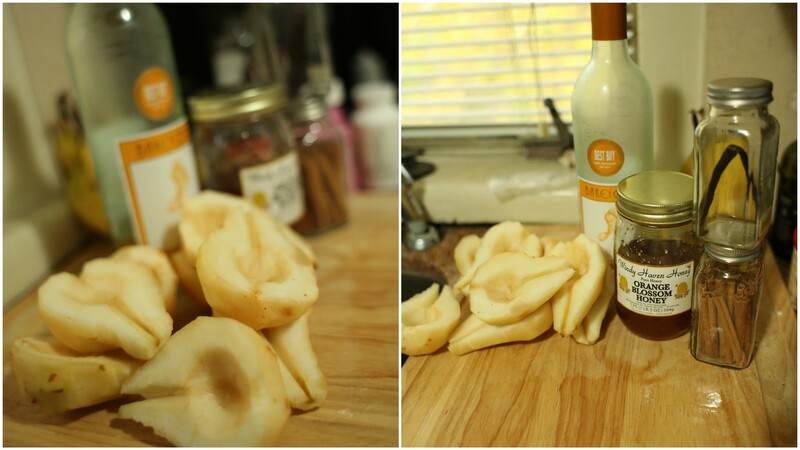 You can exnay the wine, add some orange peel, clove, ginger, anise…whateva you like! Experimentation is up to you! 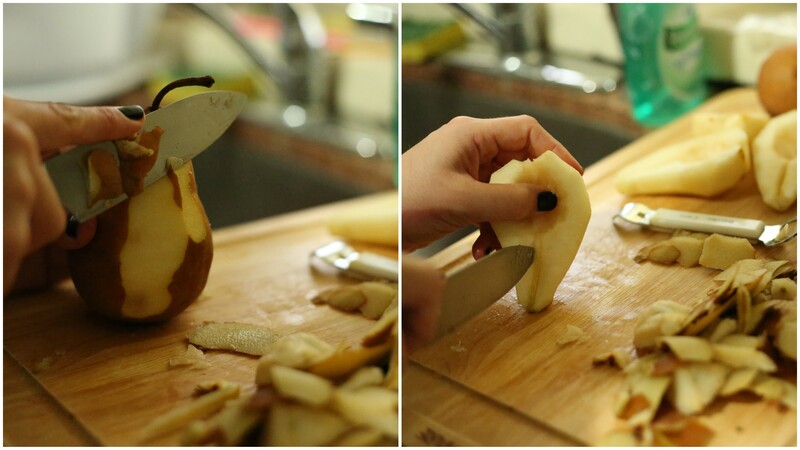 While the liquid heats up on the stove, grab those pears and start peeling and coring. 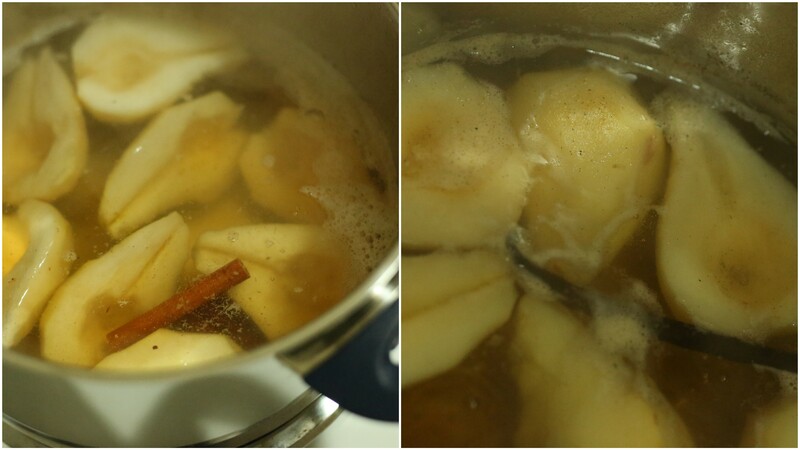 Once your pears are all peeled and cored, and your liquid is boiling; put your pears in and lower the heat to medium. Let those bad boys simmer down now for about 45 minutes to an hour. Enjoy with some vanilla ice cream, chocolate ganache, or all by themselves. I’ll probably throw them in with my yogurt and pumpkin granola for breakfast. mmmmm mmm! You’re welcome! Posted in Uncategorized and tagged autumn eats, pear, poached pears. Bookmark the permalink. Rarely am I so captivated by a blog to forage wildly through the entirety of the archives, but such was the case when I stumbled upon Sweet Ambs cookie blog. Her lovely little cookies are showcased through beautiful photos and videos set to classical music. Some of her cookies are hand painted, others are painstakingly embellished with royal icing to resemble lace or embroidery. 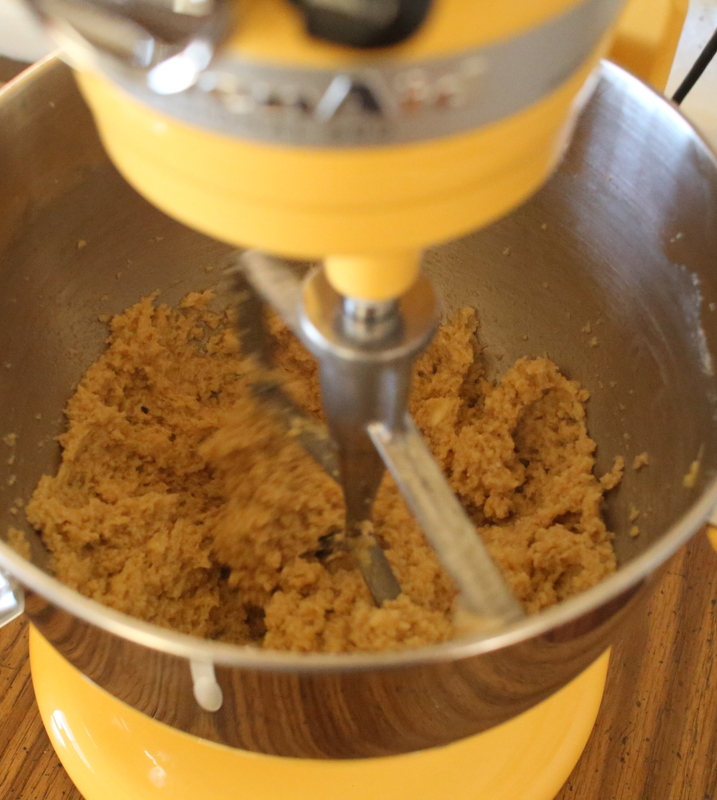 Regardless of your affinity for baking, this blog is worth the click. 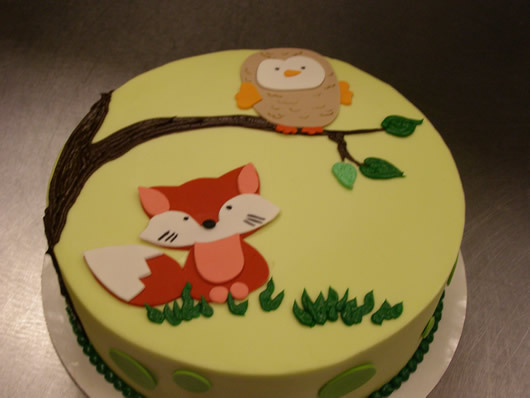 Posted in Cookies and tagged blog, decorate, featured blog, royal icing, sugar cookie, video. Bookmark the permalink.